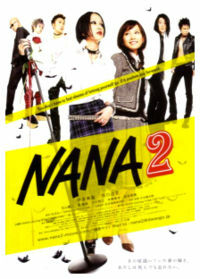 Taking place shortly after the end of the first film, Nana 2 focuses more on Komatsu Nana (Hachi/Hachiko)and her love life. Romance develops between Hachi and TRAPNEST's bassist Takumi as well as with the Black Stones' guitarist Nobu. Meanwhile, Nana works hard for her band while trying to find happiness. Both girls struggle through life, and try to keep their friendship from falling apart. More information on the story at Nana.